If you’re starting your own business, or even if you’ve been in business for a while, you may be wondering what your options are for structuring your company. There are a number of types of business entities, each of which works in different ways. Choosing the right one for your company may be the single biggest business decision you make. These are the simplest kinds of businesses. They’re easy to create and manage, and no state filing is needed to begin operating them. As the only member in the business, you report and pay taxes directly through your personal income tax return. You should be aware that, with a sole proprietorship, you’re personally liable for any lawsuits filed against the business, meaning that your assets could be subject to forfeiture should you lose a case. Partnerships are pretty much what they sound like—two or more people engaged together in a business enterprise. While there’s usually a partnership agreement in place, there’s no need to make a state filing to start operating a partnership. So, like a sole proprietorship, partnerships are easy to set up and run. Partnerships file annual informational returns to report any income or loss from operations to the IRS, but they don’t pay income tax. Like sole proprietors, partners pay taxes through personal income tax forms. Partners are personally liable for any lawsuits as well. There are actually two different kinds of LLCs—single-member LLCs and multi-member LLCs. Single-member LLCs are much like sole proprietorships in that taxes are filed and paid through your personal income tax forms. Multi-member LLCs, on the other hand, file informational tax returns on income and loss, just like partnerships. Each LLC member pays taxes on their share of the profits, called a distributive share. Both types of LLCs differ from sole proprietorships and partnerships in that LLCs require a state filing to set up the business. Because they’re an independent legal structure, separate from the owners, LLCs keep business obligations detached from personal assets. LLCs are governed by operating agreements that all members agree to, but the owners don’t need to hold annual meetings or record minutes. 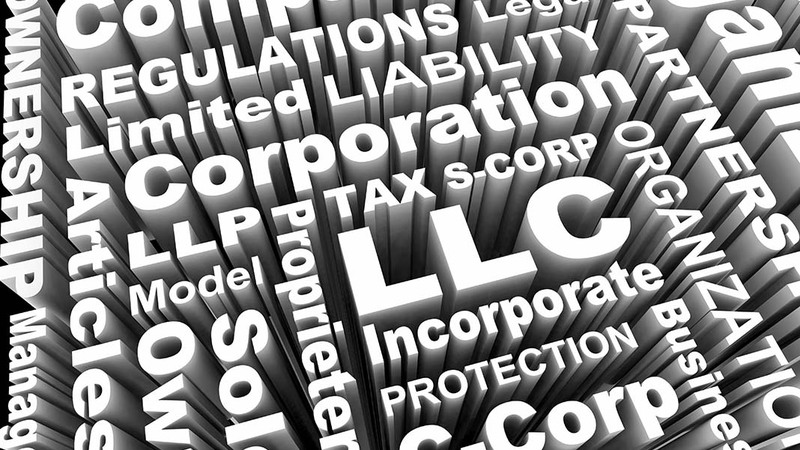 Like LLCs, S corps are separate legal and tax entities that protect the personal assets of individual company directors, officers, shareholders and employees. Structuring as an S corp allows a business to attract investment by having up to 100 shareholders, who must be U.S. citizens or legal residents. Owners in the company report their profits and losses on their personal tax returns. S corps must make state filings in order to operate. They must also hold annual meetings, record meeting minutes, and file yearly federal income tax returns. C corps are also separate legal and tax entities, with business debts kept wholly apart from personal assets. But unlike S corps, C corps may attract as many investors as they want. This allows C corps to have unlimited growth potential. Taxes are levied on both corporate profits and shareholder dividends, and tax returns are filed quarterly. C corps must also make state filings in order to operate, hold annual meetings, and record meeting minutes. Still not sure which entity is right for you and your business? A good accountant can help you make this all-important decision.